Well, it’s here! Fall has started to creep it’s way into Ohiopyle. The weather is still beautiful, the water levels are perfect, and there is hardly anyone on the river or trails. It’s a great time to come an enjoy all the wonderful things Ohiopyle has to offer. If you didn’t get chance to hit the Upper Yough this summer, don’t worry! There are still plenty of releases left in the season. 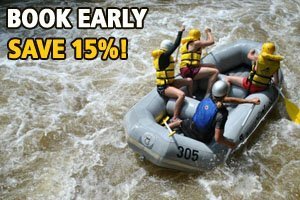 And we are offering a special for rafting Mondays, Fridays, or any day during the release week, September 15th through September 19th, for just $100 per person (plus tax)! You would be crazy not to take advantage of this great deal. Now is the perfect time to enjoy the Great Allegheny Passage as well. The days are starting to cool off just enough to make a leisurely ride on the trail really enjoyable. Make a day of it by heading up to Confluence for lunch. The ride is a little over an hour each way (downhill on the way back!). And there are some great restaurants to hit up while you are there. Stop by Riverside Bakery & Cafe for a sandwich or some pizza. Or stop by Confluence’s newest restaurant, Sherman’s Ice Cream Parlor & Kitchen for a burger and some delicious hand-made ice cream! If you’ll be hitting the trail on the weekend, the Lucky Dog Cafe is featuring a wide variety of seasonal brews to help welcome fall. Southern Tier’s Harvest shouldn’t be missed! Or just come to Ohiopyle for a stroll on one of many hiking trails in the Ohiopyle State Park. A hike around the Ferncliff Peninsula takes you to the edge of the Ohiopyle Falls and through this wonderful National Natural Landmark. And stop by the Ohiopyle House Cafe for a tasty farm-to-table lunch with fresh local ingredients. Another can’t miss at the Ohiopyle House Cafe is the famous Bloody Mary bar on Steeler football Sundays. Build you Bloody any way you like! Whatever you decide, make sure you don’t miss a visit to Ohiopyle this fall. The season is short, but it is definitely worth the trip!